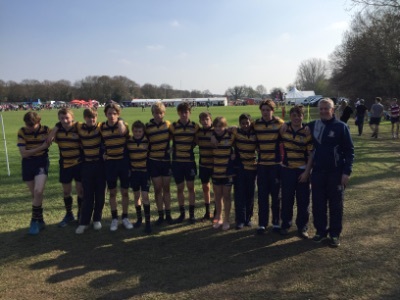 The Rosslyn Park 7s took place last week with Stowe entering 3 teams. The Seniors had a very tough group which they failed to qualify from but 3 of their losses were by 1 score; Woodhouse Grove (14-7), Hampton & Neath Port Talbot both 26-21. Dom Saghri finished at this season's top try scoere with over 20 tries! The Colts came 2nd in their group, amassing 111 points and conceding only 65 but the loss to Woodhouse Grove meant they failed to progress out of the group. The squad of 12 included 7 Junior Colts which bodes well for the future. The Yearlings, who had previously won both of their tournaments at Ipswich and Haberdashers Aske's performed superbly on the first day. The won their group with impressive victories over QEGS Wakefield, Ysgol Gyfun Cwm Rhymn and Bromsgrove and then won their eliminator match to ensure they qualified for the 2nd day. 2 tough matches saw the boys qualify for the Quarter finals of the Cup competition but with tired bodies the boys lost out to a clinical New Hall school. It was a fantastic effort from the boys with all 12 players having played their part and a fitting tribute to Mr Hughes for his last rugby match after 21 years at Stowe.